Summary, Analysis, and Review of Ryan Holiday's The Obstacle Is the Way PLEASE NOTE: This is a key takeaways and analysis of the book and NOT the original book. 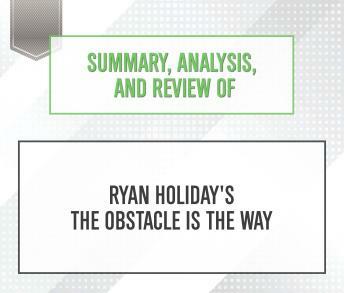 Start Publishing Notes' Summary, Analysis, and Review of Ryan Holiday's The Obstacle Is the Way: The Timeless Art of Turning Trials Into Triumph includes a summary of the book, a review, analysis & key takeaways, and a detailed About the Author section. PREVIEW: Ryan Holiday's The Obstacle Is the Way uses the ancient philosophy of the Stoics to inspire readers to succeed. Holiday argues that in each obstacle there are seeds of opportunity. The Stoics teach that you should find benefits in every barrier. Each roadblock is in fact a new road. Some obstacles are external: lack of money, lack of muscle, lack of physical capability. Other obstacles are mental: self-doubt, fear, lack of skill. Yet, the approach to all obstacles is the same. To overcome barriers requires three qualities: perception, action, and will.